Six months ago, Dr. Z suddenly left his practice, citing all good reasons. He and his young family wanted to move to his parents to be nearer to them. His father, the original Dr. Z, started the practice and worked on my teeth until I was a pre-teen. His son became my dentist and from then on I don't recall ever dreading the dentist due to our jovial conversations and my continued dental hygiene. Dr. Z ensured us in his letter that this new young dentist was one he trusted at the helm. I was shocked but happy for him. How different would a new dentist be? I was unconcerned. Time to see about that. It wasn’t until I walked in and saw the three frames replaced that I felt disappointed. Two were recolored photographs of children on a beach and another of a sailboat. The third was a childish color block painting where smiling circle-faced people of all skin tones held hands in a circle. They weren’t something I admired or thought about much; merely a place for my eyes to rest while waiting for the drill. But their absence tore a small hole in my memory. In their place were photographs of a forest and various diplomas. The receptionist was new, but I suppose Barbara had decided to stay home with her baby after all. The comically oversized yellow toothbrush had been replaced five years ago, but I recalled it now as four diplomas appeared now on the wall. I sat down on a new, black leather chair and took in the new grey lined floors, fake orchid, and contemporary women’s magazines. It was as ordinary and aesthetically pleasing as any doctor's office you can visit anywhere. But here, in this space, it was like the dream I had the previous night that I couldn't shake all day. Something was terribly wrong. Bilbao, and passing through on the Camino de Santiago. "Alex?" Now, the only face I recognized, Rosa, walked to show me the room. I smiled at her and said sadly and hopefully, "it's nice to see a familiar face." "Yeah, I'm the last one," she said, shrugging. Although I’m pretty sure her job is to check on patients before the dentist or hygienist comes in by asking questions about dental health, Rosa and I only every talked about life. She was easygoing the way you don't see often in medical settings; all sway and no bustle. As she talked she leaned her body against the back of the x-ray machine. We talked about her children (one was the former receptionist), jobs, traveling. “If my kids weren’t here, pffft---” she motioned with a hand cutting across the air—“I’d be back. In Italy.” We talked about Italy, relatives. She told me that no on in Italy is crazy like we’re crazy here. “I mean, they are CRAZY,” she emphasized, “but not like this. Everyone rushing. Needing something right now, can’t wait. Everyone driving everywhere.” She spoke this as she raised her eyebrows, shrugged her shoulders, and sighed. My head shook in unison. I told her how this past summer on the Camino I had met a Swiss man who lived close to the Italian border and seemed to embody this attitude. On my first night walking, anticipating the journey to come in Bilbao, I was bristling with nerves and possibilities. I wasn't yet exhausted from the daily walking so I tried to capture the late sunlight over the red brick Bilbao with watercolor in my sketchbook. I was talking to a new friend, this Swiss man, as he smoked his cigarette and I sketched. The atmosphere was so serene I remember trying to capture and remembering that peace on paper. I described my feelings of anticipation; I told him something like: "I just hope I can relax. This year and the trip so far has been chaotic." He then very lightly and naturally grasped my hand and said "Alex, it is the easiest thing, to relax." as he exhaled smoke from his lungs. I felt tears well up in my eyes, knowing the tension of my country and its hectic pace and thus my hectic life was written all over me. Rosa spoke also of how families lived there, and communities. "You are a part of it everywhere." I nodded, I felt the same; and I was reminded of the lack of community here, in this now-foreign dentist chair. Missing the familiar I'd overlooked. Blue gummy sticky hands, spinning tops, temporary tattoos, keychains. The trappings of a dentist visit I could recall in my sleep in order: talking and catching up, flossing, brushing, x-rays, fluoride mask, toy, name on the “good brushers board.” Mixed in each step was a fluid conversation from Dr. Z, and garbled sounds until he took the scraper out of my mouth for me to respond. I was lucky. I hated most procedures during the visit. But Dr. Z was the bright spot in my visit. He wrote down what I’d talked about last time and picked back up. Asked about my brothers, remembered their names after 10 years of them actually being patients. We talked a lot about travel. He traveled the world before dentist school; he even met his wife while traveling in South America. We talked about cathedrals, first cars, school, college. He offered advice and responded to my spit-laden answers, which I’m sure wasn’t easy while also not jamming a metal tool into my gums. I had almost felt like crying when talking to Rosa. Strange what kinship can form over being the last of the old guard, seeing the changeover from family owned to new practice. Now I really felt like crying because Dr. D was jabbing my gums with the sharp end of the scraper. “Are you flossing?” “Yes.” “Everyday?” “Yes.” “There’s a lot of blood. I’ll have to show you how to floss better.” I kept my proverbial mouth shut since; I didn’t have the tact to tell her that the blood was unusual because the dentists and hygienists I’d had before had never jabbed my gums in multiple places during a cleaning. How many degrees were in the front room? Were there any specializing in aggressive dentistry? My sketch of Bilbao that evening when I heard important advice. I wasn’t being fair. But as I looked up, rather than listen to the voice of someone I’d talked to for more than a decade while using a spit-suction, counting how many nose hairs extending pretty far out of his nostrils, seeing the large, sunny, yellow overhead lamp, I saw this new face, with fancy eye-glass magnifier/lamp combo. The sunny yellow overhead lamp was still there, but covered over with plastic, light off and obviously obsolete. Much like my feelings, the toys, the bright colors, the childish choices were obsolete. The cleaning passed without event. She packed my dentist bag for me (I didn’t choose the color). We passed by the good brushers board ( Where I had signed it “Alexa the Great” since reading about Alexander the Great in 5th grade. So clever, but not today.) I checked out at the desk. The new face at the desk didn't ask about my mother because she didn't know my mother and didn't know me. Dr. D is a good dentist, I'm sure. She may develop strong relationships with her patients. Maybe her receptionist is already familiar with other patients and their mothers. Maybe other patients will unconsciously relax in the office seeing the familiarity of the photographs on the wall I saw as alien. Someone's loss is another beginning. But I still felt like something treasured was lost because the practice was not a tradition of father to son. That sense of care and commitment and personality was gone in a routine move. I can imagine it was hard for Dr. Z to leave, and his father, Dr. Z, to retire when he did. It feels surreal, as a patient, to see that gone overnight (as six months can feel between teeth cleanings). So, why was I so emotional? Was it the approaching full moon? The lack of sleep or stressful work day? Or more of an unexpected feeling, one that comes from there being a space that used to exist, that does not anymore. When my parents no longer needed our home number and home phone, the feelings were similar, and unwelcome as they were strange. What will happen to the memories of my childhood phone number? What good comes from still having it memorized? Why did I make fun of my mother for keeping the defunct answering machine, with recordings of my siblings and I and now-gone family members? That was her way of memorializing the lost. At least I had Rosa to talk to and muse about our different but connected reminiscences on a place. When you're not aware of your attachments to certain relationships you compartmentalize, such as teachers, dentists, doctors, etc., whenever you build a relationship with someone, even if they're not your friend, it hurts like hell when that connection is severed. I'd never considered the details of a dentists office worthy of reminiscence and fondness, but the human heart is a funny thing that likes what it likes and doesn't always say why. In the first chapter of her new work, Feel Free, Zadie Smith protests the downsizing and stripping of a library and several small businesses in Willesden, London. "Everybody's just standing around, talking, buying or not buying cheese, as the mood takes them." She goes on to describe the bustle of activity around the concrete structure of the Willesden Green Library Centre of families, market sellers, children, homeless men, all outside, "simply standing around in the sunshine, like some kind of community." While the antagonists of this essay are politicians and corporate profiteers looking to make money off of luxury apartments, and not the normal move of a dentist out of his family practice, the gap exists in both stories. The gap left by the congregate mass that is brought together by physical space, need, and routine. Maybe, in the end, it's all simply an allegory for the leaving behind of childhood, though I'd hate to stake my childhood on a one-story brick medical office that always smelled like Lysol and carpet cleaner. That family feeling of being remembered, of being made to feel important doesn't discriminate based on location or activity. It's something we all need. To manufacture it is nearly impossible. And if it can't be passed down through a family, then I hope the need for it grows on its own. Have a place you remember lost to change or circumstance that you grew unexpectedly attached to? Share in the comments, I'd love to hear. One day this week, I woke up with a dream still swimming in the semi-conscious soup-state between sleeping and waking. Excited, I grabbed my journal and jotted down images, conversations, and choppy sequences before they vanished. Many of my friends will likely roll their eyes in acknowledgement that I relish in sharing dreams and listening to others' dreams. Some are delighted to share, others patiently listen and offer interpretations, or at least open their ears to my dream tellings. they would spell the answer. You see, being someone who finds meaning in many natural occurrences, I find special meaning in dreams. Even if they are a collection of random chemical or electrical firings, they seem to hold a mirror to our minds. And if there's anything I've learned in self-reflection, it is that our minds are vast, unknown landscapes to us. Even in believing you have yourself "figured out", (as I explore in this past post), you soon discover a new facet of yourself that remains raw, unpolished, and surprising. Carl Jung, psychiatrist, psychoanalyst, and founder of analytical psychology, was extremely invested in dreams and their meanings. Dreams unveil our desires, our fears, and our obsessions. While I could go on about my recurring hiding-from-bears dreams or being-repeatedly-trapped-by-a-giant-wave dreams (I know, I know, still working on feeling overwhelmed by everything), I would much rather spend time on the dreams of desire. And no, I'm not explicitly speaking of sexual or romantic dreams, though those are important and valid indicators of a certain kind of our desire. Instead, I speak of the pleasant feelings in dreams that mirror what we desire in our daily lives. In last night's dream, I was part of a community. Though scraps of the "plot" remain, it resembled a sleep-away camp, with everyone sleeping communally, cooking meals together, and coming together to talk and sing. This reminded me very much of the backpacking hostel culture in Europe and the albuerges of El Camino de Santiago. While I did spend time in said dream walking around the beautiful desert/ocean landscape, I spent most of my time around others. This feeling of belonging to a group seemed so natural and warm, I could hardly believe it was created in my mind upon waking. Almost painfully, I admit my desire to find a community in my conscious hours is unsatisfied. Humans are social creatures. We know this. We can find it in our evolution; a key factor in the survival of species amidst hostile, predator-laden environments. We can find it everywhere in fact--people desire to be around other people. Even introverts like myself. Acceptance, I would argue, is the number one motivator in most of our actions. Friend groups, clubs, teams, unions, political parties, nations....We swear allegiance to a group that accepts certain aspects of our nature. And while I'm grateful for my work community and my scattered circles of friends, that pull for a group acceptance remains strong, and if I'm honest with my needs, remains absent from my life. Is it wrong to ask for this, appearing ungrateful or naïve or delusional? In my culture, yes. I won't speak for the nation, or other ethnic groups besides the culture where I come from but I find a lack of this open honesty about our needs everywhere. I am just as much a perpetuator of this culture as the next person. We are molded from Puritan ethics in New England, seasoned with the weather, changing seasons and harsh winters. Even among close-knit, small-town communities which I witness everyday at my job, there appears a distance and unwillingness to discuss and ask for certain things. These unmentionables that we strive for: acceptance and love. Could it be projection of my own lack of these? Yes, it could. But what I see mimics the popular media, culture, conversations, and lack of effective communication in our local and national politics. To be honest about what we need: love and acceptance, is seen as weak. One reason I feel I can write about this without seeming delusional is that I am not the first to mention it. We joke in New England about our temperament. I've had frank conversations with friends and colleagues about it. And while between individuals the traits of warmth , generosity, and open-mindedness vary greatly and are often present, the collective culture does not appear to be interested or invested in such traits, nor open to talking about them. bell hooks, who I must have found at just the right time (thanks Theresa and others! ), plants this seed of questioning in my mind. In her book, all about love: new visions, she describes with clarity my longing for acceptance and frustration at my own pursuit for it. "So many of us long for love but lack the courage to take risks. Even though we are obsessed with the idea of love, the truth is that most of us live relatively decent, somewhat satisfying lives even if we often feel that love is lacking. In these relationships we share genuine affection and/or care. For most of us, that feels like enough because it is usually a lot more than we received in our families of origin. Undoubtedly, many of us are more comfortable with the notion that love can mean anything to anybody precisely because when we define it with precision and clarity it brings us face to face with our lacks---with terrible alienation. The truth is, far too many people in our culture do not know what love is. And this not knowing feels like a terrible secret, a lack that we have to cover up." "the will to extend one's self for the purpose of nurturing one's own or another's spiritual growth." "Some folks have difficulty with Peck's definition of love because he uses the word 'spiritual.' He is referring to that dimension of our core reality where mind, body and spirit are one. An individual does not need to be a believer in a religion to embrace the idea that there is an animating principle in the self--a life force (some of us call it a soul) that when nurtured enhances our capacity to be more fully self-actualized and able to engage in communion with the world around us. " Now, if you're still shaking your head, so be it---you are absolutely entitled to reject this as anything I or anyone writes. But this could also be described as the part of you that reacts when someone hears your innermost thoughts and validates them. The part of you that is normally hidden but flourishes when finding an activity that gives you fulfillment and pleasure---one that connects you with other people to create the bond we call acceptance. If that is a definition of soul or spirit, then surely most if not all of us have a spiritual growth which is nurtured by ourselves and others. And that nurturing is defined by hooks, and by me, now, as love. The search for this love, this acceptance of soul or spirit, has rarely been answered in my life. It is the warmth you feel when someone listens to you and interacts with you, seeming to see the hidden parts of your soul or mind or whatever you want to call your "essence". I've known this with few people in my life-both in romantic and platonic relationships. It remains a treasured experience, and an emotional one. Now, all other quests for this love that don't meet the criteria fully are not meaningless or without lessons learned. Many are lifelong quests; within our own families or communities. I have learned many lessons from my experiences with unfulfilled love. I found myself in unrequited situations which felt so painful at the time, but upon reflection there was no way for intimacy to occur and thus no way I could be truly hurt. Being hurt by someone who loves you back, from the definition of love which Peck describes, is unbearable. I consider myself lucky to have found a love under this definition. I recall throughout that first real relationship and in perhaps only one other relationship of romantic caring/love how uncomfortable I felt when the other person gazed at me and listened when I spoke of hopes and fears close to my soul. These fragile declarations were being heard for the first time and were accepted. My fear of being rejected in those moments was so real that I was in near panic, incredibly emotional. I felt ashamed of these emotions, one never used to crying in front of others as I learned in my family and culture. The thoughts were not foreign to me at all, but sharing them with another human was terrifying. It still is. I guard myself, we guard ourselves, from rejection so carefully. I feel these admonitions are rarely shared. But the desire to share them is strong. Luckily, though I wish it was more commonplace, the people who heard these words did not reject them, but made me feel as though I was safe and heard. This feeling, I can imagine, is not felt by many who find themselves in relationships without love and acceptance. Is there a way we can teach and learn this collectively? "Another way of looking at this is as a conflict within the human heart, as a conflict between the bureaucratic, hierarchical, aggressive parts of our nature, which in a neurophysicological sense we share with our reptilian ancestors, and the other parts of our nature, the generalized capacity for love, for compassion, for identification with others who may superficially not look or talk or act or dress exactly like us, the ability to figure the world out that is focused and concentrated in our cerebral context. Our survival is (how could we have imagined it to be anything else?) a reflection of our own nature and how we manage these contending tendencies within the human heart and mind." Our survival of our relationship with ourselves is tied to how we resolve conflict within ourselves. What we learn and accept about ourselves, we then extend to other people. And learning about yourself means seeing where you are coming into conflict and discovering ways to critically examine and change the behaviors that lead you to self-loathing and self-sabotage. When we don't resolve these within ourselves, we project them on others. It is so common to have a fixed mindset when we come across these conflicts. 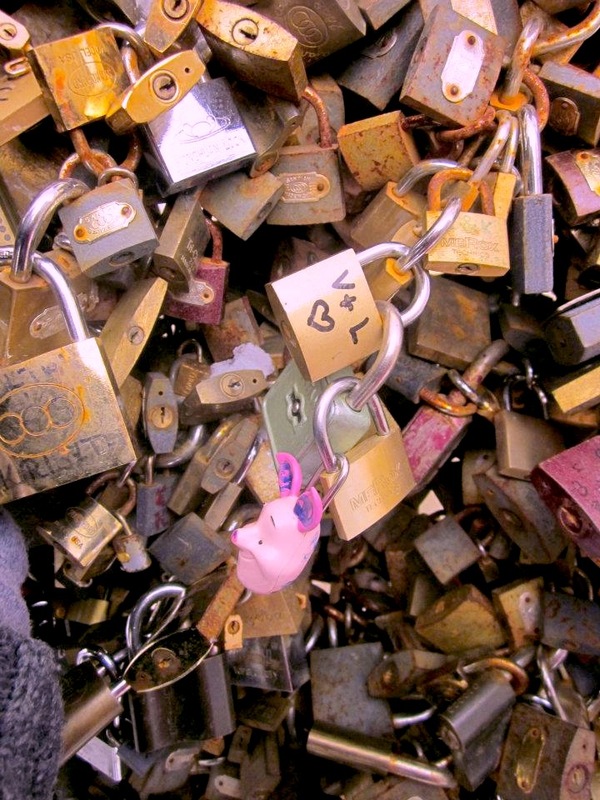 Lover's Locks: public proclamations of love now popular all over the world. These reside in Pécs, Hungary. "It is particularly distressing that so many recent books on love continue to insist that definitions of love are unnecessary and meaningless. Or worse, the author suggests love should mean something different to men than it does to women---that the sexes should respect and adapt to our inability to communicate since we do not share the same language. This type of literature is popular because it does not demand a change in fixed ways of thinking about gender roles, culture, or love. Rather than sharing strategies that would help us become more loving it actually encourages everyone to adapt to circumstances where love is lacking." All smiles. My family in Piacenza, welcoming me with a pizza dinner. "This might be an overstatement or exaggeration, but after being here among my distant family, I feel that all our problems-with drugs, alcohol...all our problems period, come from the need to close the gap between ourselves and other people. The gap is formed by culture and family structure. I see it here; children brought up with so much love, surrounded by family. A family where everyone picks up the newborn child and showers it with love." During a dinner on my second night, I asked my second cousin Matteo if he ever wanted to travel or live anywhere else. He thought about it for a moment, then told me: "No. I love it here. My family is here. Why would I leave?" Exactly. Where you find your community, you stay. When you feel love and acceptance, there is no reason to leave that comfort. "The practice of living consciously, self-acceptance, self-responsibility, self-assertiveness, living purposefully and the practice of personal integrity." This process is ongoing, and not solved overnight. (And is any "problem" really every "solved"?) I am bolstered with resolve and hope when I see other humans pursuing this practice of self-love. Zine culture, (which I've written about here) is a place full of writings, drawings, instructions, and recollections on self-care and self-love. Two creative humans create such zines which you can find here and here. I love that more and more people seem to be sharing their thoughts on love. February brings these conversations out into the open, as we encounter the inevitable consumerization of love. We can meet this holiday with cynicism or try to go deeper. Despite my mixed feelings on Valentine's Day, I find it a wonderful opportunity to be open about love. When we are open, we learn the commonalities between ourselves and other people. When we are open, we accept the complexities about ourselves. We can relearn and redefine productive ways of loving. We can be honest about what we need to change in our understanding of love, taking responsibility for our happiness. traveling thoughts / where are we now?